Sneak preview of the new book! I’m casting my mind back to Auckland, New Zealand in 1995 and it seems a long, long time ago. Regardless, I was in chronic back pain. A good friend suggested we go and do a ten week beginners Iyengar yoga course that his friend was teaching. Now this was before the internet, before yoga selfies, maybe even before Yoga Journal had found it’s way to New Zealand. I have no recollection what-so-ever of knowing what yoga was, or what it looked like. I can’t remember even having seen a yoga posture. All I knew was that I was in pain, I could barely move, and I had serious flexibility issues. I turned up, and despite my limited range of mobility and pain, was well-looked after and supported into postures with multiple props. (Iyengar Yoga can be a great foundation for beginner yogis). I wonder now, if I was in the same physical position today, would I have made it to yoga class? Because now we’re inundated with thousands of yoga images and selfies in our social media streams. Now, yoga is a multi-billion dollar industry and images of asana and meditation are used to sell everything from soft drinks to cleaning products and clothing. Now, everyone knows what yoga looks like – right? It looks super-flexible, slim, gorgeous and young. Therefore, if I were contemplating starting yoga in 2014, would I have this image of yoga as something that fit, gorgeous, bendy people do and therefore something that was not for me? It’s a question that’s impossible to answer. Yet I suspect that there are now probably hundreds if not thousands of people out there who would love to try yoga yet don’t because it’s really intimidating to go to your first yoga class – especially if you don’t look anything like the common image of a yogi. Add to that the systemic issues around class, race, money and privilege and there’s even more people not experiencing yoga who would love to and who would benefit. (Like people in prison, which is why I’m a big fan and supporter of the Yoga Education in Prisons Trust). Back in 1995, I was fortunate. Pain and total inflexibility were the only things holding me back and I had a caring and patient friend who literally hand-held me to my first yoga class. What about all those people who would love to try yoga but are put off by the clothing required, the perceived level of flexibility required, the weird language that’s used, the strange sounds you might make or the confusion of all the styles of yoga available? What about all those people who might have dabbled in yoga, but are now asking how do you find a good teacher? How do you know if someone is a good teacher? How do you decide which style of yoga is for you? What if you don’t want to do postures – is there something else you can do that’s yoga? These are the people I’ve written The No-More-Excuses Guide to Yoga for – I’ve taken my experiences of yoga over the last fifteen years and distilled it down into a book so I can hand-hold people into their first yoga class and beyond. In the course of writing this book I’ve also realised how exclusive yoga can be and while I’ve done my best to address some of this exclusivity there’s no doubt that I too have my blind spots. This is one reason why I’ve invited a handful of other yoga teachers and writers to share articles in this series, Because Yoga is For Every Body. I want to widen the conversation around yoga and get more perspectives on how we can make yoga more inclusive and how the yoga community can also be more inclusive. In the Because Yoga is for Every Body series you’ll be hearing from people like Mark Whitwell, Roseanne Harvey, Anna Guest-Jelley, Eve Gryzybowski, Nadine Fawell and Jason Brown. They’re all passionate about how yoga is perceived and shared in their own way. Mark is big on the intimacy of yoga and breath and making yoga a natural part of our lives. Roseanne has been involved in conversations with Lululemon and Yoga Journal about body image in yoga culture, and Jason Brown teaches from the perspective that Gentle is the New Advanced. Anna has started a Curvy Revolution in the States and has talked about the challenges of being larger in yoga before on The Yoga Lunchbox. 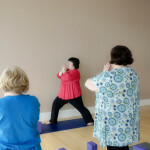 Eve has been teaching yoga for over thirty years and she’s seen the seismic shift in the yoga world firsthand. She’s also the author of two books and writes a blog. Nadine is another yoga teacher and writer who has written for The Yoga Lunchbox before. She’s based in Melbourne and passionate about reaching people where they are and catering for busy people – Nadine runs a business called MM… Yoga. I’m thrilled to have these people, and more, joining me in this conversation on why yoga is for every body and what we as students, teachers and studios can do to make this a reality in our world. As part of my commitment to broadening the yoga student base, I’m donating $1 from every print copy of The No-More-Excuses Guide to Yoga to the Yoga Education in Prisons Trust plus 5% of online copies. This is in addition to the $1 per copy of Forty Days of Yoga and 5% of online copies I donate. Yoga changed my life and my world, and it began with that first Iyengar class back in 1995. I’m forever grateful to the friend who took me to class, and the teachers who made me feel welcome and comfortable. Now I hope this book can provide the same type of service to the hundreds and thousands of people out there who want to try yoga but are afraid, for whatever reason, to make it to their first yoga class. Next week I’ll be opening up pre-release orders for The No-More-Excuses Guide to Yoga. I haven’t finalised pricing yet, as I still need to finalise printing costs, but it’s likely that subscribers and Insiders will receive some kind of deal. If you’re not already a YLB subscriber, sign up at the top of the sidebar. Underneath that, you’ll find where to become an Insider. And then stay tuned for the book release! Seems I am in some good company here! Looking forward to the festival of yoga-for-everybody! You’re in great company Nadine! Great article. Thanks for this wonderful article.